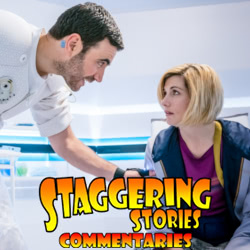 Staggering Stories Commentary #223: Doctor Who – Kerblam! 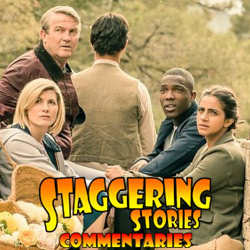 Adam J Purcell, Andy Simpkins and Keith Dunn sit down, unboxing, in front of the 2018 Doctor Who episode ‘Kerblam!’, and spout our usual nonsense! BBC: Doctor Who – Kerblam! 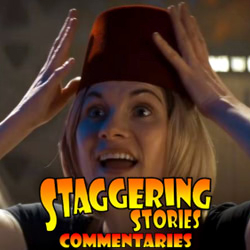 Adam J Purcell, Andy Simpkins and Keith Dunn sit down, hospitalised, in front of the 2018 Doctor Who episode, ‘The Tsuranga Conundrum’, and spout our usual nonsense! BBC: Doctor Who – The Tsuranga Conundrum. 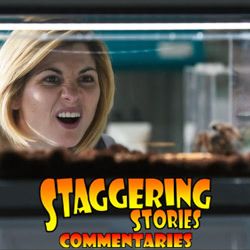 Adam J Purcell, Andy Simpkins and Keith Dunn sit down, scuttling, in front of the 2018 Doctor Who episode ‘Arachnids in the UK’, and spout our usual nonsense! Wikipedia: Arachnids in the UK. BBC: Doctor Who – Arachnids in the UK. 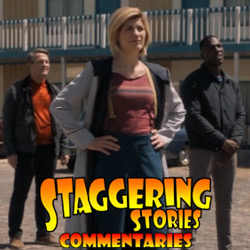 Adam J Purcell, Andy Simpkins and Keith Dunn sit down, segregated, in front of the 2018 Doctor Who episode, ‘Rosa’, and spout our usual nonsense! BBC: Doctor Who – Rosa.